Nature and Man are both anarchic and rebellious; each can create revolution in its own way! Colour, both natural and synthetic, is no exception and you will soon find that by adopting an experimental approach you will reveal some unusual and exciting functions of colour. The books target audience is embroiderers and textile artists, but I think you can use it what ever art form you’re in to right now. There is a chapter on colour theory where Caprara talks about colour harmony, the complimentary colour contrasts as well as primary and secondary colors, tints and tones and how we can combine colors in different ways. Be prepared to be experimental and inventive, and take note about how you feel when you work with different materials. She suggests that you examine how different hues goes together and also how other colors work with your colour family. When you write notes in your journal collection you will see how it comes alive, and years later you can return to it and remember your discoveries. Caprara gives lots of suggestions on how you can enhance your collection, narrow it down or widen it, collect around words or poems or sketch from nature. Later in the book Caprara has even more fun assignments, and in the later half of the book she describes how we can paint with stitch, experiment with different embroidery techniques and use the colour collections in our fabric design. There are suggestions and ideas in this book to keep a full time artist busy for a year or two, but collecting colours and experimenting with them is a life project. You can tell Caprara has taught many inspirational workshops in her life when you read her book. I will take this book down many many times form the book shelf to get inspirational infusions and new colour combination ideas. I’ve already read it three times now! 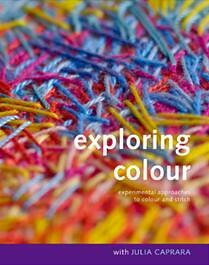 You can buy the book Exploring Colour (with Julia Caprara: Experimental Approaches to Colour and Stitch) second hand at amazon or directly from the publisher d4Daisy where I got mine! English textile artist Julia Caprara was the director and principal of Opus School of Textile Art that she started together with her husband Alex. Julia Caprara sadly died in 2008. I really like Caprara’s style and would love to read her other book The Magic of Embroidery (1993) but it is not available at amazon, so I guess ebay will be the place to look for it. You can get this Caprara book from her publisher D4Daisy though, it’s run by Maggie Grey. 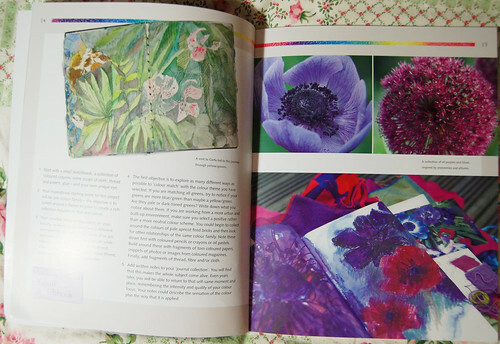 She publishes lots of cool books on mixed media and textile experimenting! 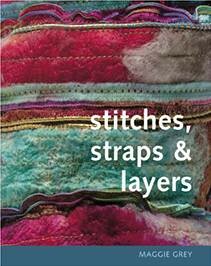 I’ve also read Maggie Grey’s own most recent book called Stitches, Straps & Layers (2009). It’s a beautiful book with lots of extremely yummy and very layered images of fabric surfaces. In the book the aim is to build textiles from the bottom up and recycle the materials you already own as much as possible. I love the photos but can’t really say I’ve been inspired to do anything in the book (yet). Oh except maybe when I was sewing paper strips on the sewing machine? Now that I think about it I guess I was inspired by the straps in this book! The biggest reason I haven’t dived into making projects from the book is because I don’t own the things required, like abaca paper, vanishing muslin, foil, misty fuse, carrier rods, paintsticks, puff paint, adirondack paint or even a heat setting tool! What, you say, you don’t own any of these things? It feels kind of strange to have to buy quite a few new stuff as the book says it’s all about recycling! With that philosophy in mind I would have thought I could at least try to start experimenting, but I can’t do any of the projects with what I own… :-( I wish I had more money. Always. If you’ve got some experience in mixed media fabric art though (and own some foil and other fun materials), I think you’ll want to explore the projects and ideas in this book. Oh, by the way – you can find very cool Free tutorials (downloadable PDF-files to print) at another of Maggie’s sites! I love these pdf’s and I’ve downloaded all of them! Check them out. 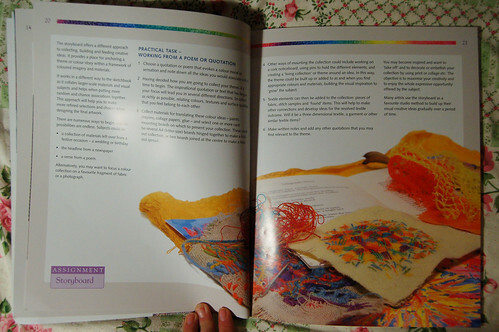 This entry was posted in Book Reviews, Fabric Art and tagged colour theory, embroidery, exploring colour, rainbow. Bookmark the permalink. I love hearing about great crafty books – especially as I love working in fabric! I do have colour-stress and would like to be a bit more knowledgeable about how it can all come together. 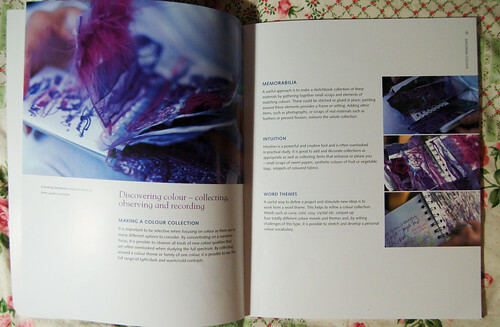 So the Exploring Colour book looks great! Thanks Hanna! I have a friend who is a great sewer and loves, loves, love textiles of all kinds. She has recently gotten into wet felting and has down some great scarves and things. Her biggest challenge is the color mixing. She often calls me as I seem to have the eye for it. This book sounds like just what she needs. I think it is time to buy a surprise giftie for my friend ! I also wanted to tell you how much fun I have been having receiving incredible postacard from all over ! I love it ! I haven’t posted much about it as I have been so busy but I wanted you to know how wonderful it was to participate in the postcard swap this year ! Thanks for that ! Thanks for your comments girls! Jen, I think you will like this book, maybe you too will do a “pink collection” (thinking about the postcard you made! ), hehe. Kim, this book is not so much about color mixing (how strange it is that color is spelled different in English and American English, I always spell if different these days, hehe) but I think it will help in terms of thinking about how you approach and use colours both in arts and crafts! :-) So happy you are enjoying the postcard swap! Your blog always inspire me. take care! hey – thanks Hanna – this is just great – I love new inspiration – this might be just the thing to get me using all those blank notebooks i have! Hey Hanna – thanks for the kind words. I’m so glad that you like the Julia book – it was such a priviledge to work with her on it. She is very sadly missed.